The Lyrids are a strong meteor shower lasting from April 16 to April 26 each year. The Lyrid meteor shower is expected to reach maximum intensity overnight from Saturday to Sunday (April 21 to 22), with the best observing opportunities coming between midnight and dawn on the 22nd local time, experts say. The moon will be nearly new at that time, so its glare shouldn’t drown out too many of the Lyrids’ brief flashes. The dark skies could make a big difference for meteor-watchers, because the Lyrids are historically a mild shower. NASA forecasters expect a peak rate of 15 meteors per hour this weekend, though the Lyrids have produced outbursts of 100 per hour in past years. And just as the Lyrids’ peak rate can vary dramatically, so too can the brightness of each individual meteor. In 1982, amateur astronomers counted 90 Lyrids per hour. A stronger storm occurred in 1803, observed by a journalist in Richmond, Virginia. Meteor showers are generated when Earth plows through streams of debris shed by comets on their path around the sun. These icy, dusty chunks burn up in our planet’s atmosphere, leaving behind bright streaks in the sky to commemorate their passing. The Lyrids‘ parent comet is called C/1861 G1 Thatcher (Comet Thatcher for short). 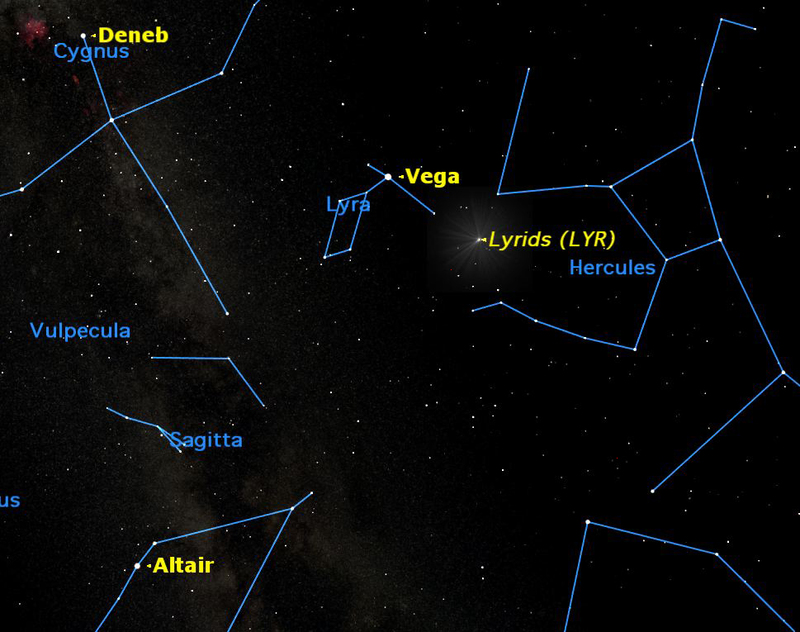 The Lyrids have been observed for the past 2600 years. The Lyrids take their name from the constellation Lyra (The Lyre), because they appear to emanate from this part of the sky. Lyra is a northern constellation, so skywatchers in the Northern Hemisphere generally get much better looks at the Lyrids every year than do folks who live south of the equator.